A Little Help For Your "Friends"
When it comes to breast health, there are certain measures that women and men can take (yes, men get breast cancer too) to protect the breast tissue. 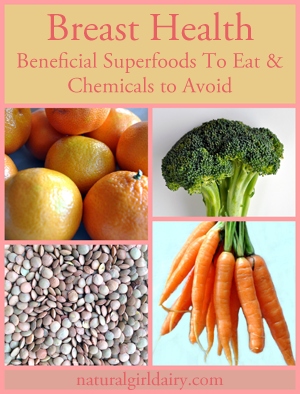 Below are some Superfoods to add to your diet, plus chemicals to avoid if you want to give your mammaries a helping hand. Here are samples, with links to additional information and recipes, of Superfoods for breast health. (Quotes accompanying food images come from Ann Kulz, MD). "According to Harvard Nurse's Health Study, people who consumed beans and lentils two times per week were 24% less likely to get breast cancer than those who consumed them less than once a week." "This class of veggies contains some of the most potent naturally occurring anti-breast cancer agents ever identified. It's best to eat your cruciferous vegetables raw or lightly cooked, as their phytochemicals can be destroyed by heat." Click here for a list of cruciferous vegetables with recipes. "Oranges are brimming with cancer-fighting Vitamin C and folic acid and provide every known class of anti-cancer phytochemicals." "Yellow, red and orange hued foods offer broad spectrum natural "chemo" prevention, light cooking increases bioavailability." Click here for more yellow, red, and orange hued foods. Arugula, Broccoli sprouts, Fiber-rich foods (fruits & veggies are full of fiber), Folate-rich foods (asparagus, beans, broccoli, edamame, lentils, oranges, romaine lettuce, spinach), Omega 3's (walnuts, salmon), Olive oil, Parsley, Plums and Peaches, Watercress. 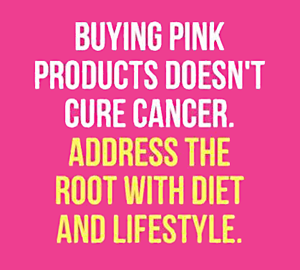 Did you know that many personal care products contain carcinogenic (cancer-causing) chemicals? It pays to take the time to read ingredient labels and know what you are putting onto your body. The helpful infographics below will give you a primer on some of the top ingredients to avoid.